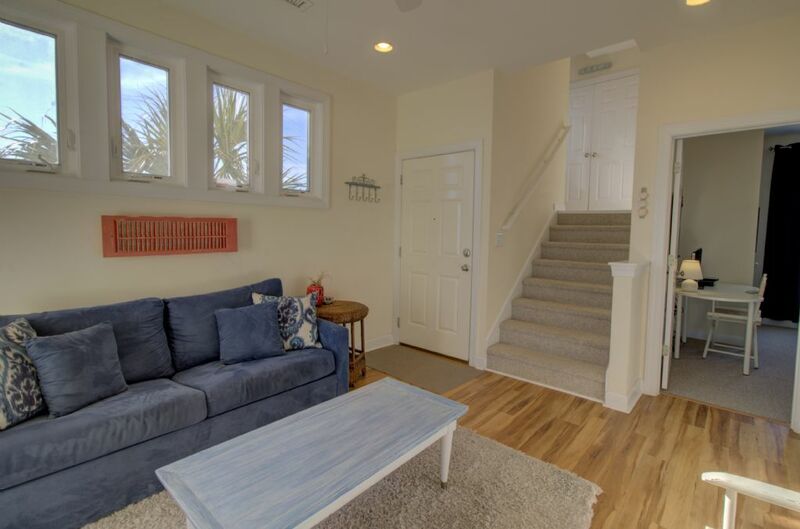 Address: 1701A North Shore Dr.
"Blue View" is a stunning, essentially-oceanfront, end unit townhome in the Summer Winds community of Surf City on Topsail Island, NC. Breathtaking views of blue seas and blue skies are almost everywhere you look. 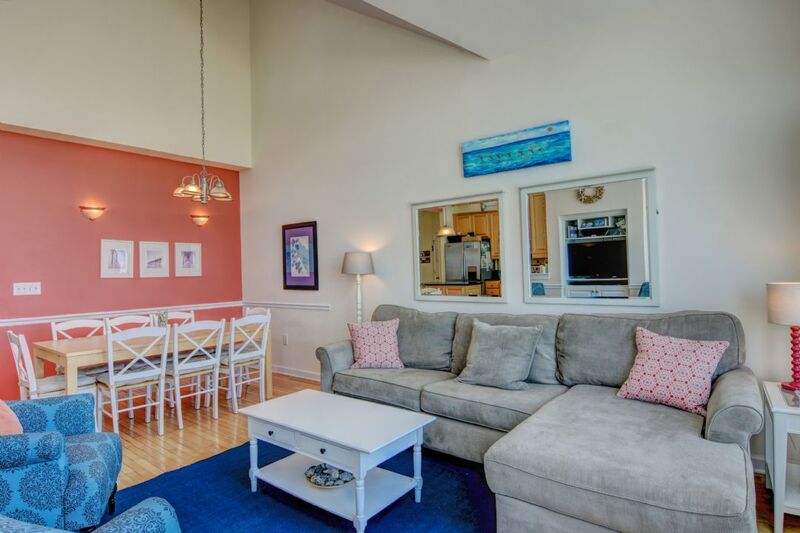 Direct unobstructed ocean views let you see all the way to the pier to the South and just as far to the North. 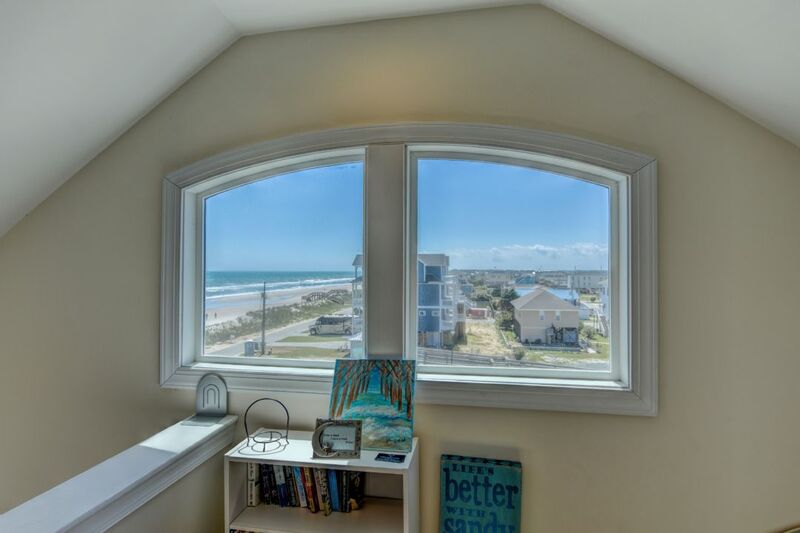 This unit gives you incredible sunrises from the couch or deck and even sunsets from the loft. 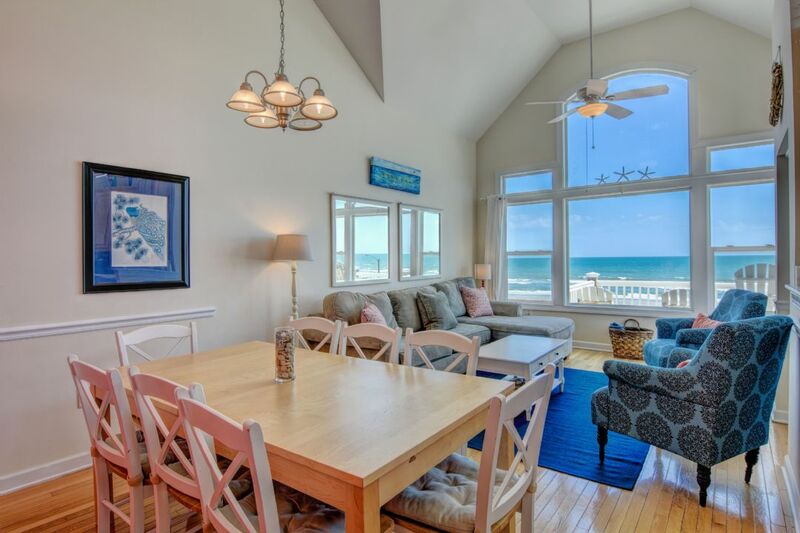 Huge windows, soaring ceilings, and two large wraparound oceanfront decks provide a true coastal retreat. Three bedrooms; each with its own en-suite full bathroom, two living rooms, a powder room, and a reading loft provide plenty of space for everyone to relax. Award-winning architecture makes this home something truly special. Just steps from your door in one direction and you are on the beach, in the other direction, the pool and large sun deck. 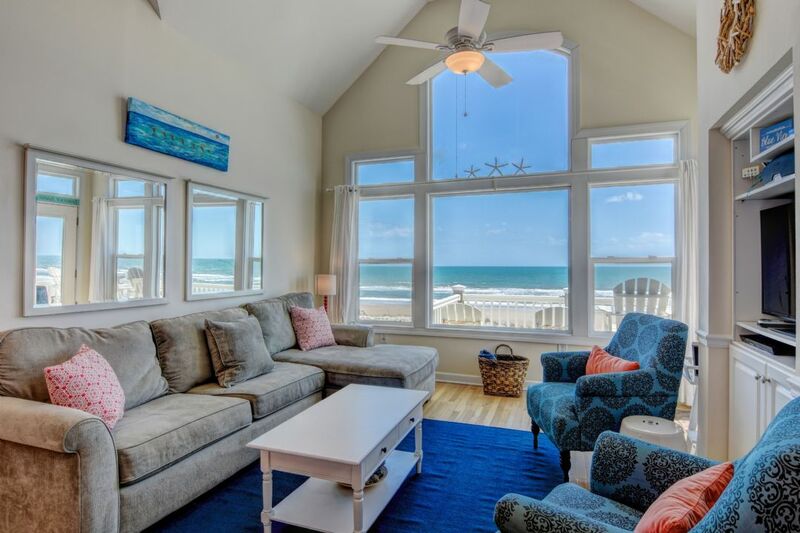 Imagine relaxing in the evenings to the sound of the ocean and enjoying your morning coffee while watching the waves, surfers, and dolphins. 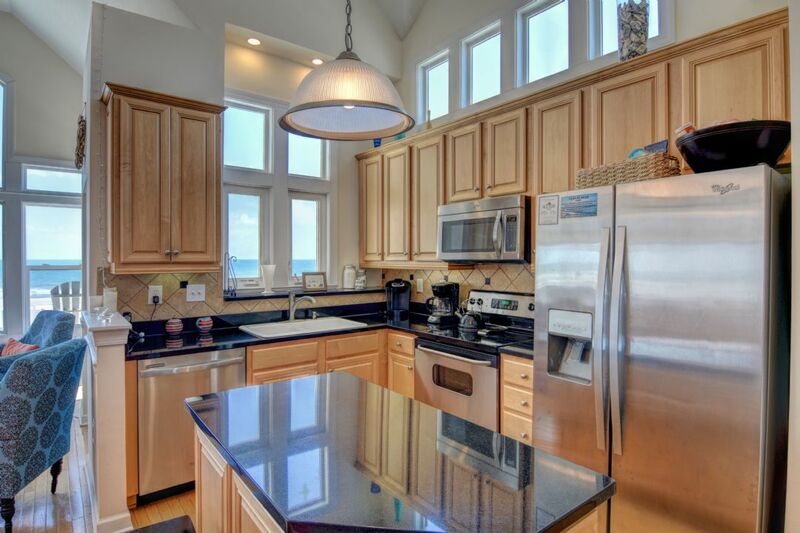 Enjoy surreal ocean vistas while cooking, eating, watching TV, or lounging too. 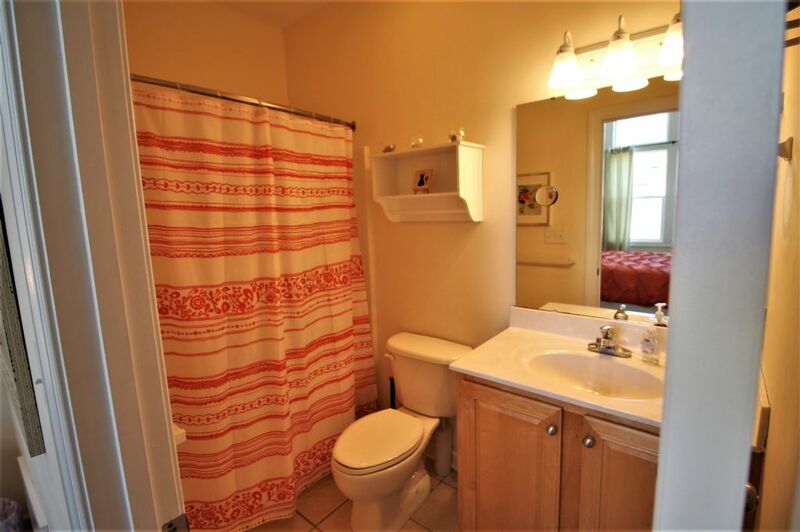 All this and a great location close to town in one of the few communities with a pool on the island. Community pool is open from Memorial Day to Labor Day! The living room on the main level has a brand new luxurious sleeper sofa with chaise lounge, reading chairs and a new flat screen TV. There gorgeous kitchen boasts stainless & granite and a chic new dining room with a table that expands to seat up to 12. A french door opens to the first large wraparound deck which has an unbelievable 180 degree unobstructed ocean view and is furnished for dining alfresco or reading on the high Adirondacks. 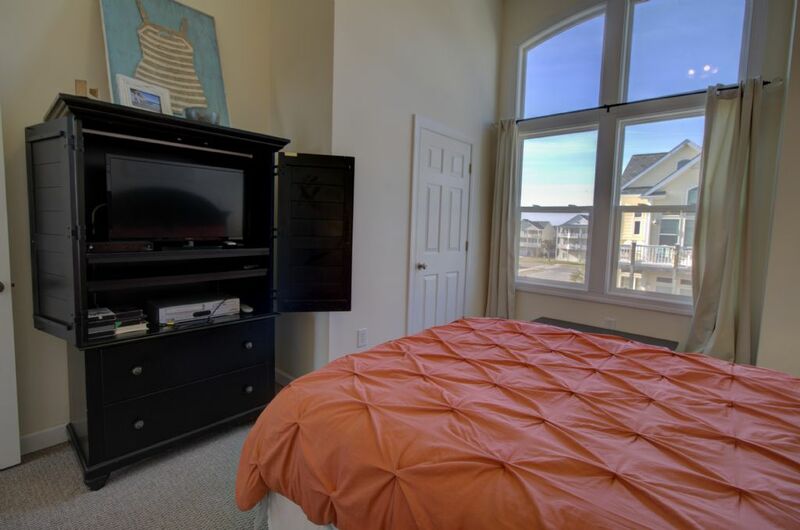 The master suite on this level has huge windows, a jetted bathtub, a queen bed and new flat screen TV. 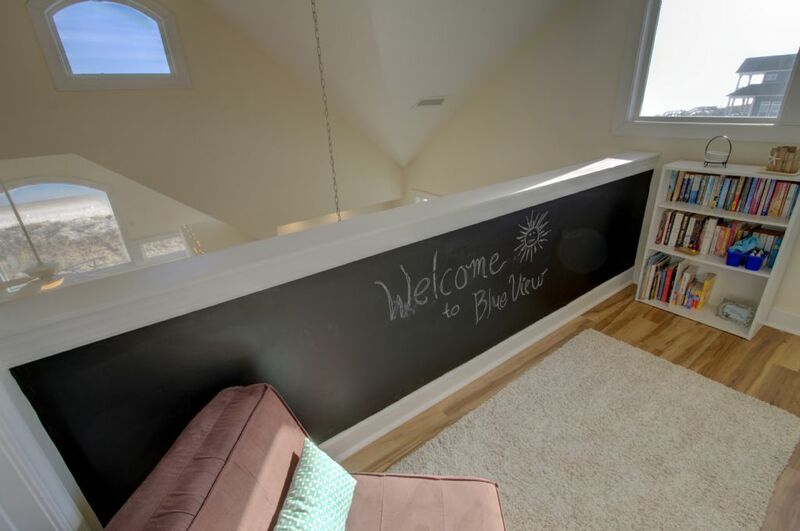 The reading loft features a chalkboard wall to provide hours of entertainment for the kids and gorgeous ocean and sound views. 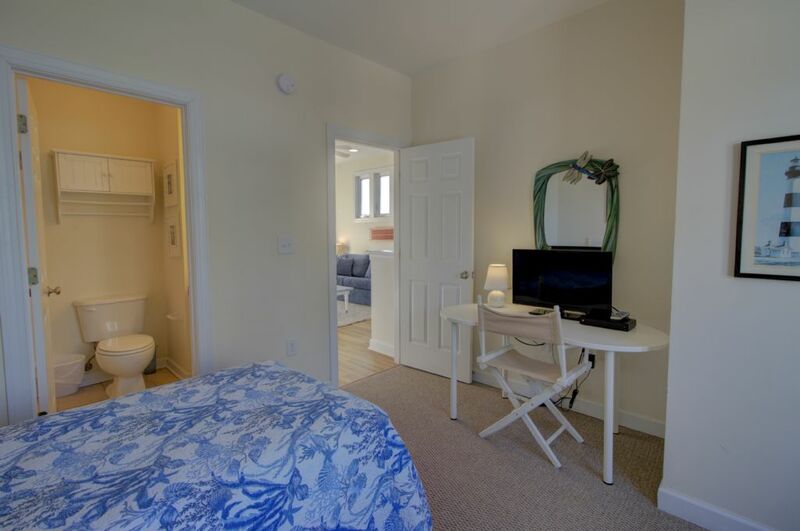 The lower level has a second spacious master suite where you can enjoy the ocean views from your comfortable king bed, flat screen TV, and private bathroom. This level also has a twin bedroom with a desk/monitor and a second living room with sleeper sofa and flat screen TV. Glass doors lead to the second spacious oceanfront wrap around deck--this one is perfect for the shade lovers in your group with more ocean views. Ceiling fans are found throughout. The enclosed shower is an amazing experience, you can enjoy a refreshing hot shower while listening to the waves and feeling the sea breeze. 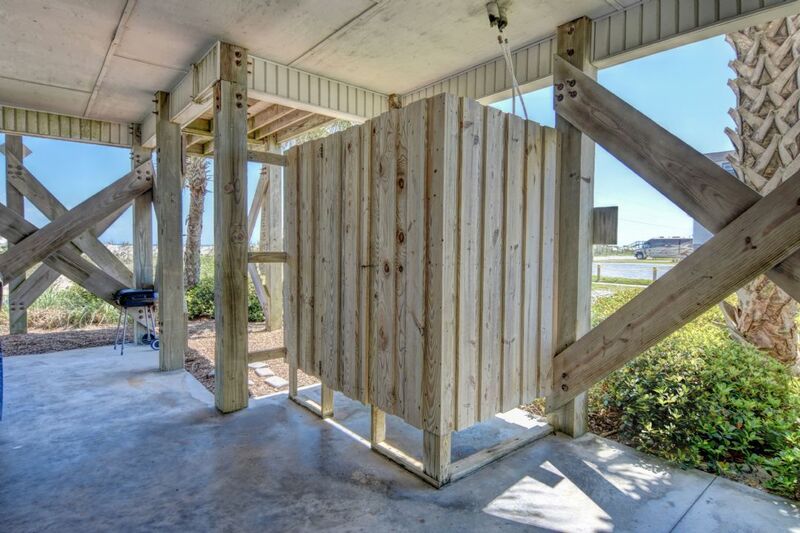 Plus, if you have a houseful of beach-goers, it provides a fourth shower and kids love it! A full-size washer and dryer, five new flat-screen TVs with 125 cable channels, two Blu-ray players, dedicated high-speed wireless internet, free domestic long distance calls, covered private parking, plus plenty of games and books are just a few amenities enjoyed by guests of this stunning property. 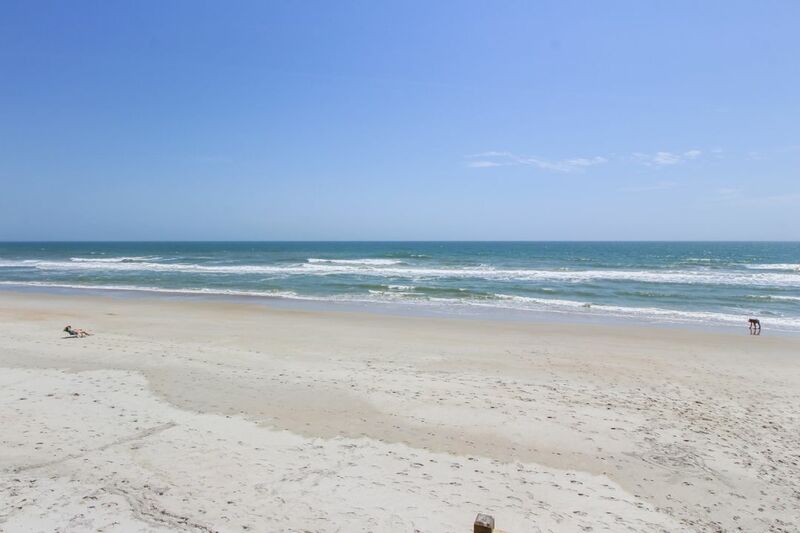 Beach chairs and toys are provided for your convenience along with touches like both Keurig and regular coffee makers, crock pot, blender, electric can opener, toaster, etc. Make delicious memories with the family-sized ice cream and sorbet maker!! If you decide to venture out, there is plenty to do in Topsail including an awesome playground for kids right next door with a cool climbing wall. Enjoy an outdoor movie or concert at the Soundside Park on Friday nights. Tuesdays bring the summer farmers market to the Soundside Park with beautiful arts and crafts and delicious goodies. Other unique not-to-miss activities include a visit to the turtle hospital, a fun throwback evening at the roller rink, a stroll at Serenity Point, or classic beach mini-golf. There is a convenience store right behind the complex and great dining on the island. "When you walk up to the main level, it is a big wow! The great room is stunning and the view is stunning! The furniture was very nice and the couch was extremely comfy. The kitchen was the most well-equipped kitchen we have used in a rental. The décor was well thought out and the colors were perfect. The bed we used was very comfortable. The unit sleeps 10 but it was just my husband and I. It was wonderful to have the space and actually very affordable compared to a hotel. The high ceilings really gave a nice feeling to the place. Of course, the view is fantastic! The upper deck has nice high chairs that take the railing out of your viewing. You can hear the waves inside and out--I love that! And, the owners were very pleasant and helpful as was the realty company they use. There is not one thing that disappointed us! We would love to come back!" "Blue View was exactly what our group was looking for on our annual girls beach vacation. The beds were very comfy, no hard mattresses here. We couldn't believe all the beach chairs, toys, etc that are provided. Everyone in Surf City are so friendly and welcoming. Thank you for hoping up your home to us." Relaxing getaway with a spectacular view! "We had a wonderful time during our stay here. 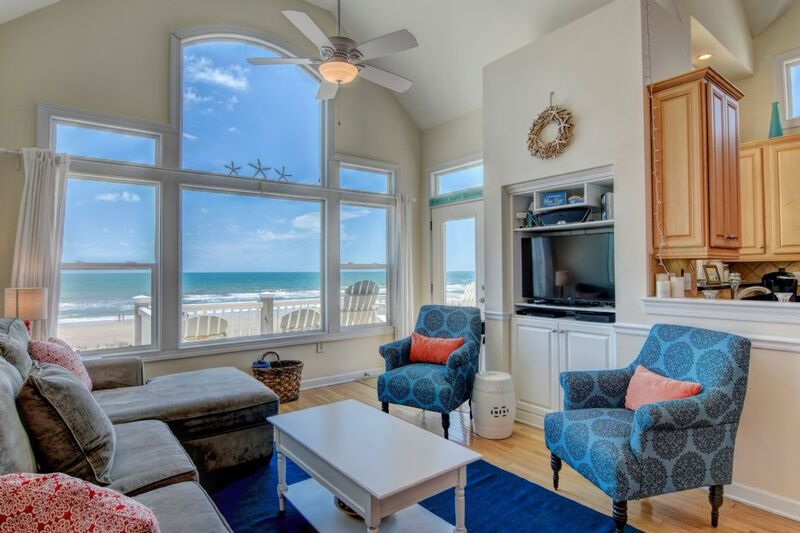 What an exceptional view of the beach and ocean! Sitting on the balcony drinking my coffee in the morning or a glass of a wine at night while breathing in that salt air and listening to the waves crash on shore will never get old! The kitchen was fully stocked with the tools we needed to make our meals when we decided to stay in and cook. 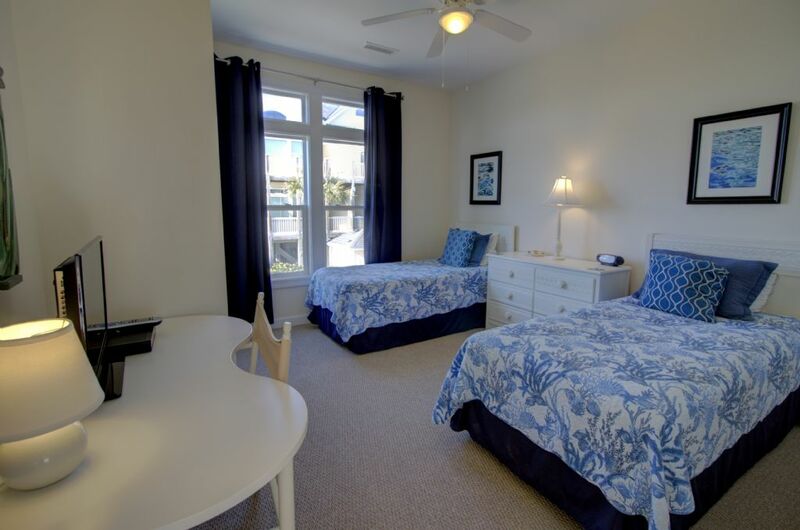 The house was beautifully decorated with a beachy theme throughout, and the beds were SO comfortable with the master bed overlooking the ocean. It was nice to walk out the door and literally be steps away from the beach. The owner also responded very promptly with any questions we had. The whole experience was a very smooth process. We will definitely love to come back and visit this wonderful beach and stay at this fantastic townhouse!" "What an amazing place! We had the pleasure of staying at Blue View for a family trip and were very happy we did so. The first floor offers beautiful oceans views that you can enjoy from the family room couch or with a cocktail out on the patio. The bedrooms were all comfortable and we easily made arrangements for our group of 7 so everyone had space to sleep. We had two toddlers with us who really appreciated the beach toys as well as the adults with the multiple boogie boards and skim boards. Beach access was simple and easy which made the experience all the better. Great kitchen space as well for nights we chose to stay in. The owners and the realty company were very responsive and easy to work with which made everything super easy. We would love to come back in the future!" "We are a family of 5 & recently spent a week in Summer Winds and thoroughly enjoyed ourselves! 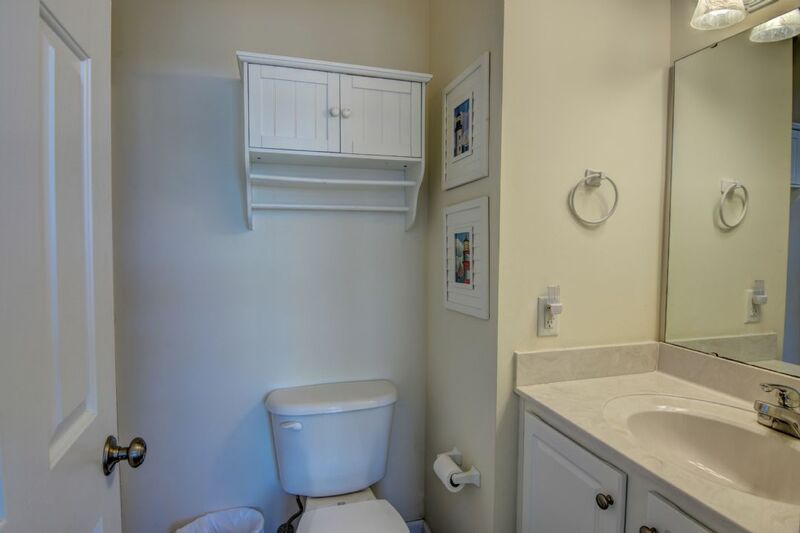 The unit was clean and well stocked with anything we could have thought of. The beds slept well enough and the showers had decent water pressure. 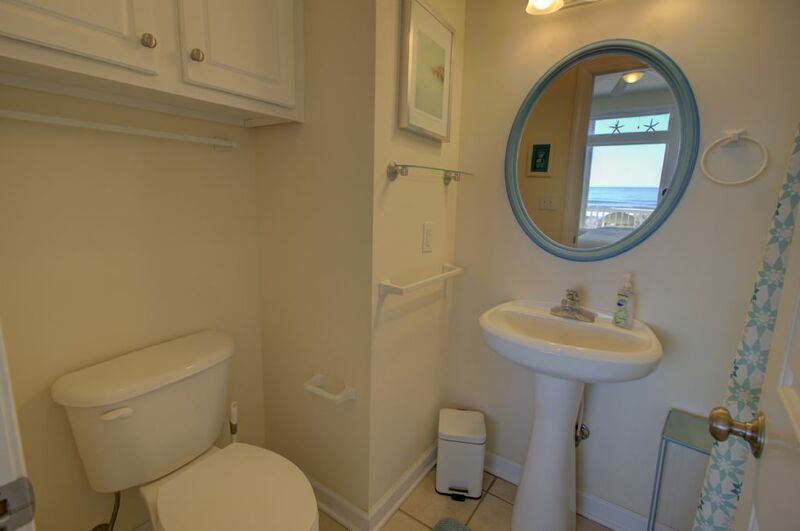 However, the best thing about this property is the close proximity to the beach & the view!! I would definitely recommend this property." 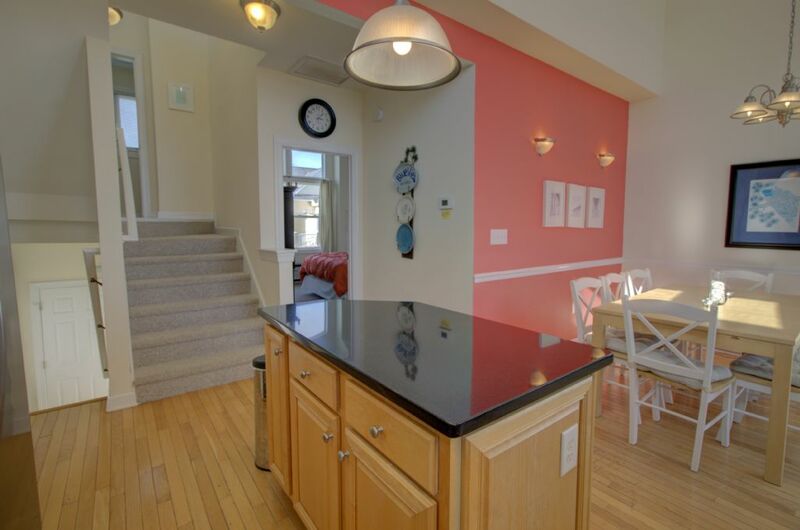 "My family was fortunate to find and rent this beautiful townhome for 2 weeks in June. We had a wonderful time and while we have always explored different properties in TopSail each year, after this stay, we are hoping to come back and stay at this property next summer. 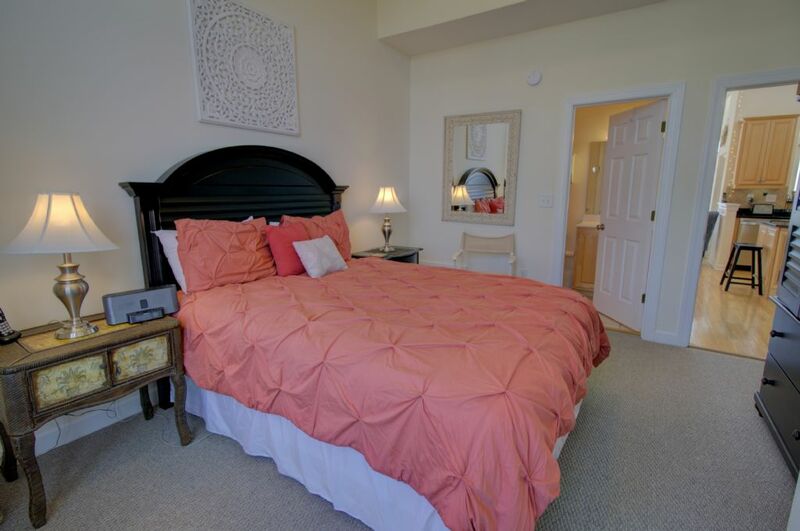 The townhome is lovely, decorated professionally and extremely comfortable for our family of 5 and visiting parents. BUT, let me tell you the very best part--the view is simply AMAZING. The pictures do not do it justice. I was awed by the view from sunrise to sunset. It is true there is a street to cross for beach access, but the street is non-busy and right in front of the house with beach access steps away. From the pictures, I imagined a much longer walk and the townhome being further away from the ocean. The convenience of this can not be understated. As mentioned, we had everything we needed to make our stay comfortable and relaxing and my children appreciated all of the beach toys and games provided by the owners. They also did not mind the arcade across the street. We also loved working with the owner who was readily available to answer any questions and make sure our stay was enjoyable. Can't wait to come again!"